BY: MICHELLE FASIG | Photos by: Paul Perdue of Perdue Vision and Greg Gayne / FOX. © 2017 FOX Broadcasting Co. 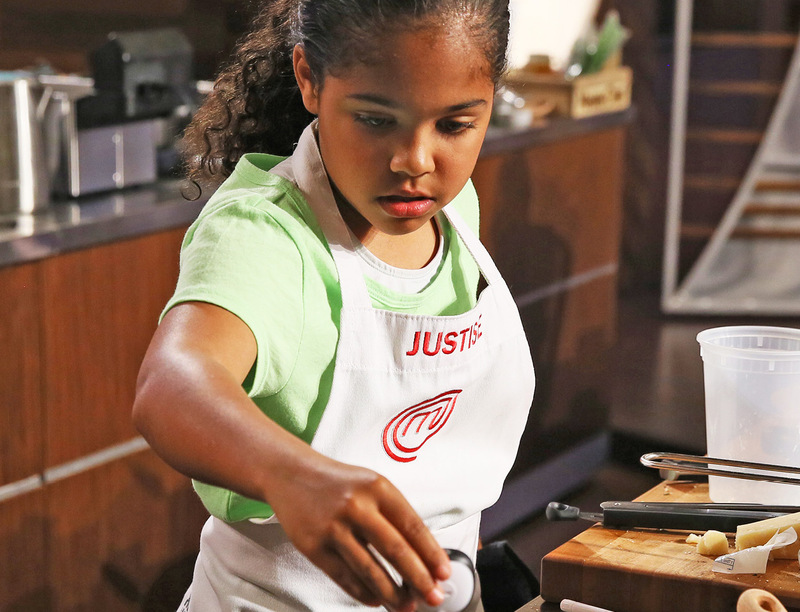 Tune in to FOX to watch Justise Mayberry on MasterChef Jr every Thursday @ 8/7c. Participating in one of the most watched cooking competitions in America might be stressful for some, but Justise describes the experience as something you get to do “once in a lifetime.” “It was really busy, but we got used to it. And, it was so cool to be able to meet (celebrity chefs/hosts Gordon Ramsay and Christina Tosi) for the first time,” she shared. At the young age of 11, Justise faced the competition with eight years of cooking experience already under her belt. Thanks to her foodie father, Jamaal Mayberry, Justise grew up around the kitchen and has spent years developing her sophisticated palate. “At age 4 she’d come into the kitchen and taste everything. She loves to eat,” he explained. “I’d let her help with prep, teaching her about different spices, and from that we went into learning how to cut… starting with a butter knife. It was a very gradual process. She soon started making her own sauces and marinades and we’d discuss what was missing or different things we could have added,” he continued. Each week the competition dwindles as kids are eliminated one by one based on a number of exciting cooking challenges, including cooking a meal for 50 first responders, cooking outdoors for hungry Boy and Girl Scouts, and cooking for VIPs such as Mayim Bialik (The Big Bang Theory). With the passion for cooking instilled in her from such a young age, Justise knew what it was like putting in hours of work in the kitchen before the competition even started. This mentality helped her keep her focus on the long days on set.